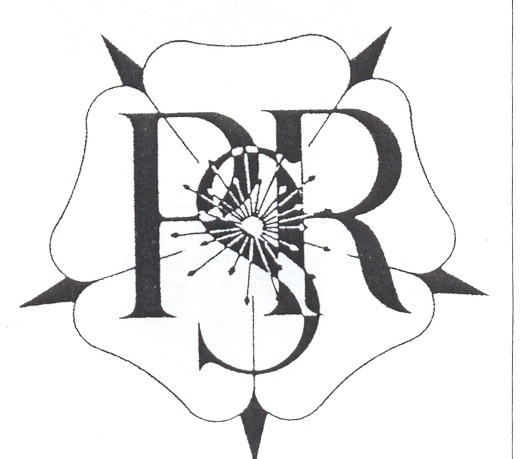 This page is where you will find the activities of the Pinellas Rose Society. As you can see, we are an active group. Come out and enjoy the friendships and the free knowledge about roses that we share freely. 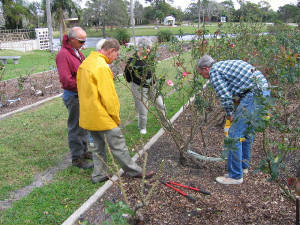 l) Tricia Weimer has an attentive audience as she demonstrates how to prune European Touch, a hybrid tea. (2) Justin Steadham discusses the merits of Lady of the Dawn, his favorite floribunda, with Chris Henderson from the Safety Harbor Garden Club. (3) Barbara Adolphson and guests examine foliage on Crystalline for signs of disease and insects. (4) George Storm ( on left) emphasizes the importance of removing dead canes as George Lawler decides where to make the cut. April 29-30 - Green Thumb Festival, Walter Fuller Park, 7891 26th Ave. Sat. - 12:00 noon - 9:00 P.M. , Sun. - 12:00 noon - 6:00 P.M.
roses by the dozen or in arrangements. There is always valuable information about roses at our meetings on the 4th Wednesday of the month at the Clearwater East Library located at 2251 Drew St. Meeting begin at 7pm and we always have an interesting rose related program. Meetings are from September through May, with the exception of December.